I started listening to TWIS as an elementary schooler and I’ve had the privilege to follow this awesome show as it’s evolved and grown! TWIS is a wonderful and accessible way to keep up with science news. I’ve plowed through four episodes - I really am interested in the subjects they discuss. But while I am trying to hear the actual science parts, the discussions is always interrupted by the male voice spewing his inane chatter that adds nothing. He’s so loud and obnoxious - he’s usually wrong. Skip this series, folks. Try the other series much better: TWIP, TWIM. Two hours is entirely too long for a podcast. Episode length should ideally be between 30-60 minutes. The man’s voice is super annoying and the production is terrible. They sound like they’re talking from inside a can. Also, the structure is loose, rambling, and contains way too many things. It’s 2019, y’all. There’s way more podcasts out there. If I subscribe, I am giving you over 150 hours of my time a year. That’s nearly a working month. Please edit your show and tighten things up to be more respectful of your listeners’ time. I wanted to be able to like this as a weekly review of things I may have missed, but the terrible audio quality makes it very hard to listen to for extended time. The host that sounds like he’s intoxicated all the time is tremendously annoying. They seem to like to pound on similar topics every week, and excessive social/political commentary in a “science” program. Occasionally produces new science. Global Warming is this podcast’s sermon. Every week you get another sermon on global warming. They preach about those who do not accept the scientific method of proving theories. The people that look for a science podcast accept the scientific method. They are not delivering hard new science. These guys were podcasting before podcasting was cool, and haven’t missed a beat! They bring an hour+ of sciency goodness every week. They sometimes have interviews with special guests and respond to their fans (TWIS minions). Their three person team has debate, brings different perspectives, and keeps it real. The male cohost is TERRIBLE. One, 2 hours is too much for a weekly podcast. I don’t listen as often as I’d like because of this. 90 minutes would be much easier to grasp but 60 would be ideal. But what TRULY takes the stars off is the dude. Holy mother of all things science is he terrible. His voice is grating, he mansplains and over talks the female cohosts, he thinks he’s hilarious and you can sense the irritation in the other hosts voices. Can him and I’d give this another star for sure. He is just AWFUL. 🤢 it’s like 2 hours of drunk uncle from SNL. I enjoyed the information in this podcast, but the sing song baby talk of the hosts made it unbearable to listen to. I replaced it with the podcasts from Science Magazine and Scientific American. I can’t believe that you joke about monkeys being tested for stress. Are you kidding me? We throw them in a cage, deny them everything natural to their lives, and then we INCREASE their stress levels? And you morons are laughing and joking about it? The Nazies did some great science and had no problem separating ethics from the work that they did, too. You are following in their footsteps. Please mature and grow up and come to the realization that when you are dealing with living things, there is an ethical cost to the science. Most reviews are 12 years old? Wow! Here is a fresh one. This is a very good and entertaining podcast, thanks to Dr. Kirsten "Kiki" Sanford, whom I have been following since her early days doing food science shows in her white lab coat and her nerdy glasses. Her team adds much and in a very positive way to the topics that are presented every week. Their interviews with interesting researchers and educators are very good, also. I listen to the podcast on my phone, a portion at a time, not the whole hour and a half, but they also have a YouTube channel. Keep it up! A wonderful mix of perspective meet in this amazing podcast! It’s great and the cast really ties it together, wonderful segments and always some good fun! It's a great show I listen every week, Gives me all the latest science news with a twist of fun and comedy. See -I used the word "twist" which is like TWIS- their acronym! Keeps me up to date and Kirsten keeps the goofing around at just the right level. Makes me smile while I learn at not too technical level about the latest. If I could change anything, it would be to tighten up the guest interviews, tighter interviewing to help the guest give the goods and leave more time for headlines and comments from the hosts. And I will probably be hooked for as long as those three keep it up. Wonderfully educational , insightful and fun podcast. Every week I look forward to downloading this and listening to it in the car to and from work. The communicators in this show are really funny and entertaining whilst delivering informative new science news. Great work! I love this podcast! It's one I really look forward to every week. I feel informed and entertained. I really tried. Justin needs to go! I tried so hard to enjoy this podcast. I am an avid science fan and podcast listener who donated generously to her favorite projects, but this podcast is a hot mess. Justin is unbearably obnoxious. He sounds drunk constantly, interrupts the female hosts often, and has no idea how to talk clearly. The long silences in the show, the sloppy editing, it's all way too unprofessional. Also, hearing the female hosts allow this ignoramus constantly interrupt them with their nervous giggles is too much for me. Please, this show has potential. Get rid of Justin and have Blair try to talk like a grown up, please. Having listened to this podcast from the beginning I appreciate very much the enthusiasm this group puts into each presentation. Basic knowledge of science is a vital underpinning of any progressive society. Science sadly is very much under appreciated in our society. The podcast has become more refined over the years but retains thankfully Justin’s quirky commentary that adds loving levity and lubricity to the flow of factoids. Blair blends very informative insights and adds an animal twist. Dr. Kiki has provided the momentum, perseverance and environment for accretion of knowledge into our social fabric. Science is a dynamically updated system of observation and application. This Podcast helps demystify and present to the layperson or science junky one of the most important subjects of our time. This group lovingly dedicates creative energy to enrich humanity and it’s very much appreciated! On behalf of me AND my high school science kids (who love the random tidbits I get from this show), THANK YOU! This show is entertaining and informative. This show not only tells you about the newest advances in science, but there is a level of explanation in each "story" that is digestible and exciting. Perhaps everything in science is fun for me, but they way in which the team gets into the stories really brings them to life for me. I often find myself using what I've learned from TWIS to directly relate to something I'm teaching in the classroom! (I team chem, physics, bio, and environmental science) While telling stories, I like how the team will continue to say things like "I wonder if the researchers thought about XYZ", "the next step for me would be to look into ABC", or "the sample size was X so we have to keep in mind blank blank blank". I really appreciate the team keeping the stories into perspective like that. Additionally, I love the relationship between the hosts! You guys have great dynamics. Week in, week out - love the show and its ability to discuss science topics at a good level that anyone can understand. What science coverage in popular media could be. The hosts are fun, sarcastic and caring...aka Dr Kiki, Justin, and Blair. I look forward to each episode to get perspective on the week's stories. As someone late to the TWIS party, I also appreciate the moment when I learn the meaning of their inside jokes. Those poor pandas and squirrels never stood a chance. Great for a general audience wanting current events in science. Definitely a different way to digest the science topics of the week, but worth the time investment! TWIS is a fun and informative show. The topics always bring up good conversations I love to have later with my husband. I have been listening to this podcast for years. I love it as much today as I did when I began. Highly recommended. I really enjoy the show. The team is always extremely energetic and in some way energizes me when I listen. Sometimes a bit over the top, but that’s better than podcasts which sound like someone is barely aware reading from a script. These guys are always bringing to light amazing and interesting things, and offer a mix of sciences fields and interests that should appeal to most. I've been listening to TWIS for several years now. It's the one constant in my life. I've never studied science but I've always been interested in science. Thanks to Dr. Kiki, Justin and Blair my knowledge and appreciation of this world and the universe has grown exponentially. I'm astounded at Dr. Kiki's vast knowledge in almost every field of science. I enjoy Justin's banter and Blair is the perfect addition to the team with Blair's Animal Corner. Not only are they great hosts, the TWIS team are very accessible to their fans or as we prefer to say - TWIS Minions, some of these minions have become great friends of mine. TWIS is fun, it's educational and the hosts are stellar. They have over 500 shows under their belt which is an incredible achievement considering that they give their time and energy to this weekly show for free. Shows you how passionate they are about the world of science. Here's hoping for another 500 shows. Listening to Kiki, Blair and Justin is like opening up your mind to a world of fascinating scientific knowledge covering a wide range of topics. Additionally they have developed a rapport that makes the show more than just science talk but entertaining, fun and a great way increase your brain power once a week. 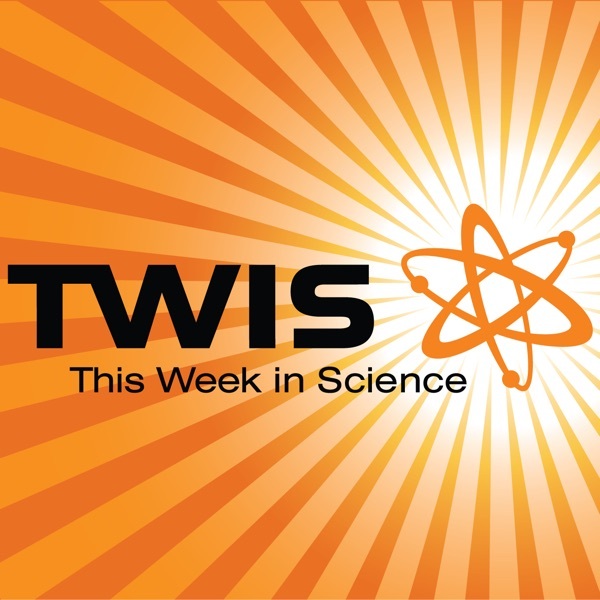 Funny, informative, and a whole lot of fun, This Week In Science is a show I will always be a fan of. Let your nerd shine with this fabulous science show. As a bonus you might get lucky and hear Kiki break into some some scinece-inspried improv singing. Love, love, love this podcast. You’ll never have more fun with science! Where was my life before TWIS? Listening to this show is the most fun I have all week. Dr Kiki, Justin, and Blair give you the hard science while never failing to entertain at the same time. If you’re not into This Week in Science, you should be. There are many fine science podcasts, but This Week in Science is my favorite. TWIS combines breaking science news with humor in a highly entertaining format. Moreover, TWIS covers the waterfront of science fields as well as providing references that allow viewers to do their own deeper dives. I have been a fan for many years. Dr Kiki, Justin & Blair are the best science communicators I know. Science presented in a fun and understanable way. Been listening for years! Enjoy the weekly update of SCIENCE with the blending of intelligent, insightful, and witty perspective. Hope TWIS continues for years to come! I hear some of you out there gnashing your teeth about the "liteness" of this podcast, but I find this to be a fun listen with a good deal of insight into what's happening in the world of science, a real antidote to physics professors who complain that "this is a physics class, not a math/engineering/circuits/memorization etc., etc., etc. class." Lighten up and enjoy science, its the REAL thing! This show is amazing, funny, educational, and awesome!!!! I have been listening to TWIS for six years. Love the podcast. Been listening to it for forever. They make science news entertaining to listen to. Love TWIS! Actual science talk with actual scientists having fun with it. So that's good. BUT I would be so grateful if they could adjust the volume levels of their music. I'll be running along listening to their pleasant banter when I'm nearly knocked off my feet and my ears start spraying blood like shamu with a blow-hole infection as the theme song kicks in at a level that seems ten times louder than the talk segments. So, in conclusion: LOVE TWIS, but may literally not be able to hear it much longer if the volume levels can't be fixed. Apparently the host doesn't feel it necessary to let the fans of the show know here or on Twitter that the show is no longer apart of TWiT.TV, nor is the show updated any longer with new episodes here on iTunes. DISCLAIMER! DISCLAIMER! DISCLAIMER! That has to be the most charmless catch-phrase in history. Who, one wonders, enjoys being shouted at by a podcast? Also, I haven't heard where other podcasts have to start out with a disclaimer, much less one bellowed out by the host. My interest in listening ends with the yelling. I tried keeping up with this podcast but I just can't stand Justin. I think he may be one of the most annoyingly vapid pop sci personalities. I hope Dr Kiki can rrecover her own show someday, until then it's Naked scientists podcast and others for me.